"It's a mean looking beast. I think it looks like the alien," remarks Chris Nelson of BAE Systems, as we walk round the front of the Royal Navy's new Astute submarine in Barrow. Looming above us is a construction shed 12 storeys high. 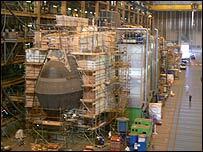 Within it are three nuclear-powered submarines at different stages of construction. And as a huge, red neon sign reminds the workforce, the first one is now just 32 days away from launch. But to judge by the scaffolding surrounding it, it's hard to believe it's going to be ready on time. "I'm determined it will be," says operations director Nigel Ward. "However it's a nuclear submarine, and lots of things can go wrong." Under all its covers, Astute is a technological phenomenon. Its nuclear reactor means it'll never need refuelling in the whole of its 25-year life. Since it makes its own air and water, it can circumnavigate the globe without needing to surface. And its weapons systems are so accurate that were it positioned in the English Channel, its cruise missiles could pinpoint targets as far away as North Africa. Indeed, down in the weapons room it looks like a Tomahawk cruise missile is already waiting to be loaded into one of the torpedo tubes. "It's only a dummy," says the man who's keeping a close eye on us. His job is to stop us photographing anything that might give away some of Astute's secret capabilities. It may be one of the most sophisticated submarines ever built, but the project has been beset with problems. 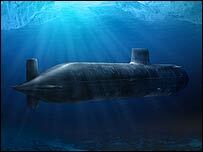 The three submarines are £900m ($1.8bn) over budget and four years behind the original schedule. But a new boss at Barrow, Murray Easton, introduced big changes when he arrived a few years back. A team of psychologists was brought into the yard to improve management effectiveness, and to create better ways of communication. Even now a psychologist is present at every board meeting. Another big innovation, learnt from the American submarine-builder Electric Boat, was to build sections of the submarine vertically rather than horizontally. Equipment can be lowered in with the help of gravity, cutting the need for manpower dramatically. It all leads to a prouder, more committed workforce. "We needed help over Easter," says Nigel Ward, "and over 300 men volunteered to work, even though the weather forecast was good." Workers are also enthusiastic about what they have built. "It's a fantastic product," says Andy Ogden as he stands near the conning tower of Astute. "And something the Navy will be extremely proud of when they get their hands on it in a year's time." Three-and-a-half thousand other workers have a vested interest in such customer satisfaction. Because if all goes according to plan, they'll be rewarded with contracts to build four more Astute submarines, and eventually the submarines that will carry the next generation of Britain's nuclear missiles.